As software developers, I think we can get caught up in the power and elegance of our own creations and fail to consider the importance of explaining their inner workings in a way that is understandable to those who were not intimately involved in their creation. Another way of saying this: teaching is hard. We don’t always know what we know. This has been on my mind this week as I’ve found myself struggling to learn a number of very useful but not-very-well-documented tools by a popular web cartography startup. 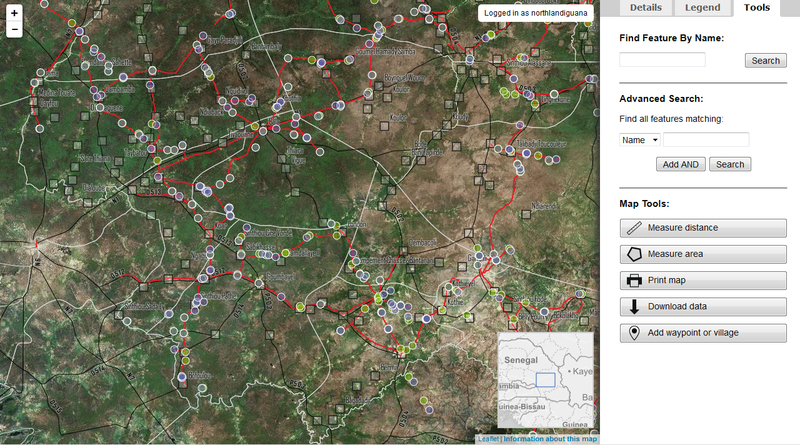 Over the past few months, I have been working on an interesting project: building a Leaflet-based wikimap of herding routes in eastern Senegal for use by academics, NGOs, and government officials examining land use conflicts between farmers and herders in the area. Because the users will not be computer experts, I am particularly concerned about not making skill-based assumptions and am trying to carefully think through the interface and how to make it as simple and novice-friendly as possible, while also providing a powerful suite of analysis tools. 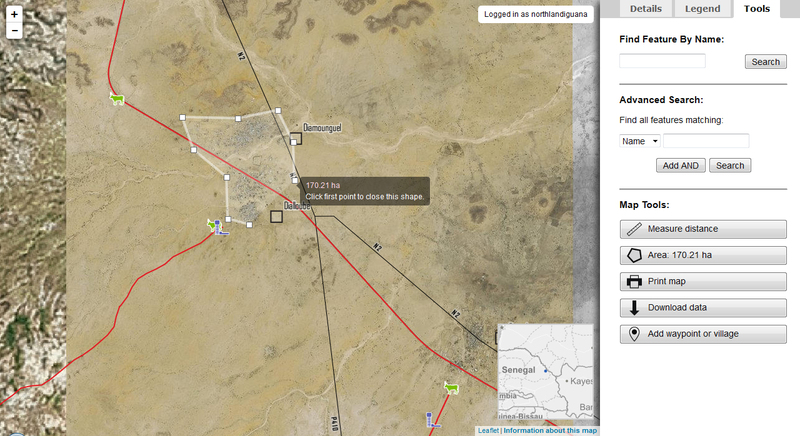 A screenshot of my latest wikimap project, showing my custom tools interface. Some of these are measurement tools. The best out-of-the-box tools for drawing vectors and measuring lengths and areas on a Leaflet map are included in the Leaflet Draw library. This library has become the standard drawing plug-in for Leaflet, used for such apps as geojson.io, and for good reason: it’s lightweight, elegant, and functionally versatile. Unfortunately for me, all of the documentation in the README is geared toward using the toolbar that is integrated into the library (left). What to do if I need to design my own toolbar? While developers at Mapbox and CartoDB are super good at reverse-engineering and editing tools for their own needs, I’m still at a API-reading and Google-for-examples skill level. Plus I didn’t really want to modify the library itself to fit my needs; I just wanted to make use of its internal structure in a way that didn’t require the vertical toolbar. Here I’m referencing a separate object, messages, that holds every word of human language that appears anywhere in the interface. In this case, messages.beginmeasure holds the string "Click map to begin". I do this because the map must be bilingual, and storing my interface strings in a separate object with a copy of each in French (the official language of Senegal) and one in English will facilitate switching between the languages. The first handler, measuremove(), simply updates the button contents with the measurement string constantly as the user moves their cursor across the map. Notice I had to use an internal function, _getMeasurementString() to get at this info, which is unfortunate. The library really should include a simple getMeasurement() method available and published in the API. But it doesn’t. Oh well. The next handler, measurestart(), makes sure that we’re not trying to pull measurement data before the user starts drawing, because that gets messy and starts throwing errors in the console. I have to use a click listener on the map to trigger this, but only want to trigger it once instead of each time the user clicks on the map. Hence stopclick. The handler only executes its code if stopclick hasn’t been altered from false to true yet, and within that code it sets stopclick to true. It’s going to change the contents of the button to say "Distance: " and apply a mousemove listener with the measuremove() handler discussed above. Finally, we have the measurestop handler. This is going to reset the button contents to the original "Measure distance" string, then remove the three event listeners added within the measure() function so we don’t place any duplicate listeners. The listeners above should be fairly self-explanatory: when to start measuring (when the user clicks on the map) and when to stop. Ah! With the second listener, we finally get to use something that’s actually specified in the API: the "draw:drawstop" map event. Well, okay, the initial Polyline options are listed in the API too. But not a lot else. This one’s very similar to the first one, except for the options and a few different messages. One important thing with the options that, again, the API doesn’t tell you is that if you want the Polygon tool to show the area measurement, you have to set allowIntersection to false. That took digging through the source code to figure out. I hope my multiple hours of trial and error can help prevent the same headache for someone else. And, ideally, I hope these holes in the Leaflet Draw documentation get filled. It really is a powerful set of tools. Happy playing!